Calgary DUI / Impaired Driving Charge? Let Greg Dunn help you! If you've been charged with impaired driving in Calgary, or anywhere else in Alberta, Greg Dunn is the impaired driving lawyer you need to speak to. Impaired driving charges are serious. If you have been charged, you need a lawyer who is equipped to deal with a complicated, adversarial system that has the power to permanently damage your life. Greg Dunn has twelve years of experience in impaired driving and other areas of criminal law. He has succeeded in defending individuals in high profile cases has gained the admiration of other lawyers, and even judges. He is a passionate lawyer who is ready to take on the establishment on your behalf, using all the tools necessary. 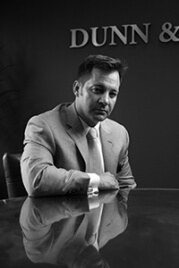 Mr. Dunn is diligent, hard working, and can make plausible and convincing arguments before the court to win your case. Mr. Dunn knows that clients need someone they can have confidence in, someone who will listen to them, and who will explain the process, step by step. You will immediately be put at ease when you meet with Mr. Dunn to discuss your case. He will find out what you need, and will take control of the situation while enabling you to make key decisions about your own future. Mr. Dunn will accurately assess the strengths and weaknesses of the Crown’s case and the relative jeopardy to you if you win or lose. At the end of the day, he will empower you to make your own decision, using the appropriate information and tools. Mr. Dunn has a wide range of criminal law experience. He is a relentless presence in the courtroom, with an energetic, lively style that commands attention. His knowledge of impaired driving and defence law goes beyond the basics: Mr. Dunn’s expertise is often requested by other members of the criminal bar, and he has appeared in media reports to give his views on criminal law. When you are facing the confusion and worry that comes from an impaired driving charge, you want to feel at ease again. Call Mr. Dunn and he will discuss your case with you in an open, frank manner. He will tell you what your options are, and will give you a straightforward answer about the likely outcome of your case. Greg Dunn is a true professional. His father was in the RCMP and he has been immersed in law from a young age. He worked for a prestigious national firm before becoming senior partner and establishing his own highly regarded firm, which is now thriving. Get this versatile advocate on your side to ensure that you are equipped to deal with the charges against you. Don’t go it alone. Call Greg Dunn today.